Review of Founders Double Trouble IPA | Beer Apprentice - Craft Beer News, Reviews, Interviews and Info. Since I have started this little blog about reviewing beers, I have consciously made an effort to try and highlight as many different brewers as possible before I repeated myself. Well, I have decided to not let that be my main premise any longer. I, do, still want to showcase as many different breweries as possible, however I also want to spotlight some of my favorite beers and to do that I am going to have to revert back to some craftsmen that have been previously mentioned. With that being said, today’s review comes from the Founders Brewing Company located in Grand Rapids, Michigan. 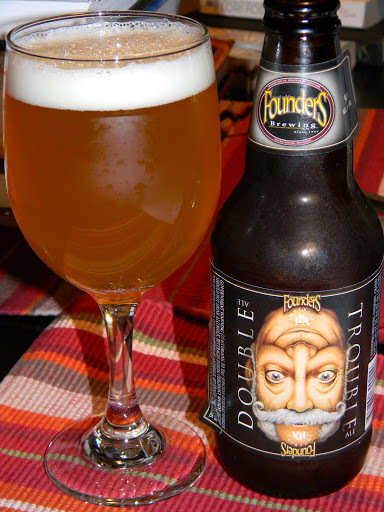 The brew I want to share this time is the Founders Double Trouble IPA, which happens to be one of my favorites out there right now. The company website, foundersbrewing.com, has this description of the Double Trouble. An imperial IPA that was brewed to turn your world upside down. Hops will get you coming and going. Pungent aromatics up front pair with a malt-balanced backbone and smooth bitter finish. Let’s give it a proper review, shall we? The Double Trouble comes in a 12 oz. bottle and has a relatively high ABV of 9.4%. It pours a tremendous looking, semi-clear, prominent orange color with a nice, tight, compact, bright white head. Some larger bubbles comprise the cap, but only at the spot of the pour. The retention was pretty good and it had well above average lacing. The overall appearance was not the best I’ve ever seen, but it was still rather attractive and did nothing to discourage me from wanting to try it. The aroma is where this beer really starts to shine in my opinion. It has a strong, fruity, citrus aroma of orange and grapefruit juice. It smells floral, fresh and juicy. Some piny notes complete the hoppiness. It smells like the freshness of Spring. As the brew warms a bit, a soft bready/biscuit malt begins to develop, which helps counteract the abundantly “hopped up” profile. I thought it was balanced perfectly. The taste is also superb by revealing more of the grapefruit and orange splashes that make a great IPA. The grapefruit seems to stand out a bit more in the taste than in the aroma, although it doesn’t render the orange insignificant. The savor has a very strong, wonderful, prominent, appealing hop bite that I found to be awesome. Another great thing that I found about the flavor profile was that I received no alcohol flavoring. I did feel the warmth, but nary a hint was tasted. Much like the smell, a bready/biscuit malt offset some of the hop zing as it started to warm, which helped add to the complexity and refine the savoriness. The mouthfeel was a considerable medium. Super dry, very snappy, crisp, smooth and clean. Enormous amount of flavor were left behind practically begging me to take another sip. Wow!!! This is an incredible beer. The Double Trouble is one of the best beers that I have ever tried and it probably is the best IPA I have ever had. Granted, be reminded that, I have not had every IPA on the market, but compared to one’s that I have tried thus far…. it’s the best. It’s very easy to drink and it could be suited for any point during the year. It’s clean, fresh and snappy for the Spring and Summer plus it has a nice, warming appeal for the Fall and Winter. I could definitely make a night of it. The only setback that I found would be that, because the ABV is a bit on the high side, it might make it difficult to handle for an extended period of time. I found myself taking big “gulps” when I should have been sipping. Either way, it’s still outstanding!!! If you haven’t had it and you like big, hoppy beers…. give it a shot. You will not be disappointed. What do you think is the best IPA on the market?